After visiting upstate NY, I took the chance to see my buddy Danny in Falmouth, MA. In fine Massachusetts tradition, we stopped by a package store; I was like a kid in a candy shop looking at all the different beers to be drank-up. Danny said he was going to convince me this is the best IPA around. I might have to agree. Usually describing an ale as "imperial" scares the living hell out of me - bitterness out the roof, barely drinkable. Not this beer. It has complex flavors, is biting but not too hoppy, and has a really fine finish. Danny says the finish is because of the yeast, but what the hell do I know? 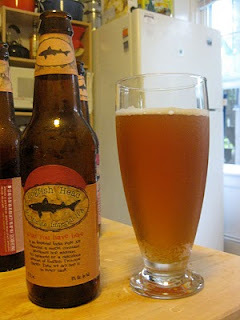 I might have to take a trip to DE to let this Dogfish give me Imperial Head in the future. Time to update the skit, Wayne and Garth.